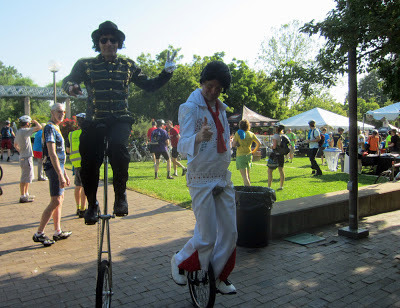 Elvis Presley, allegedly dead for over 35 years, and Michael Jackson, also thought to be dead, showed up on unicycles at the massive Rosslyn pit stop for this past Friday's Bike to Work Day. Even being dead is not an excuse for not biking to work. If Elvis Presley and Michael Jackson are now biking to work through Rosslyn, why aren't you? County Board Chair Walter Tejada rode his bike to the Rosslyn pit stop. Arlington County police officers were also there on bikes. Leading local bicycle advocate Bob Cannon rode his bike to the Rosslyn pit stop, worked as a volunteer at the event, and then rode his bike to work. The Ode Street Tribune's investigative journalist sliced through the massive traffic jam in Rosslyn to arrive quickly at his reporting assignment at the Rosslyn pit stop. Getting on your bike is the way to go.